Your maximum heart rate is an estimate of how many times your heart should beat per minute at its maximum rate. If you exercise at or above your maximum heart rate, you can face certain health consequences. Speak to your doctor before starting an exercise program that uses your heart rate as a guide. Certain diseases and medications, such as diabetes, heart disease and drugs to control blood pressure can alter your maximum and target heart rate. Your approximate maximum heart rate is 220 minus your age, according to the American Heart Association. 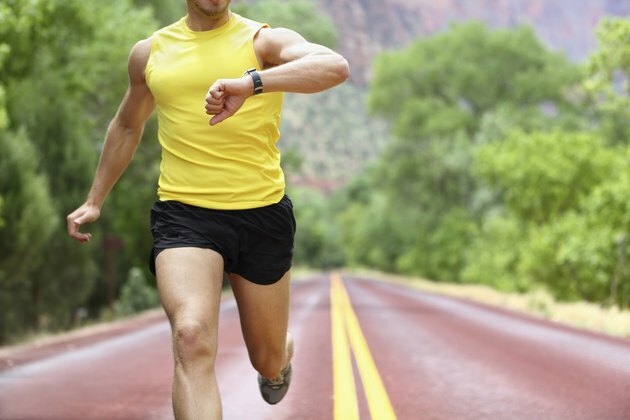 By calculating your maximum heart rate, you also can determine your target heart rate. Your target workout zone is typically 50 percent to 75 percent of your maximum heart rate. Other formulas are available that take your gender and age into consideration, states the Cleveland Clinic. If you work out hard and come close to or reach your maximum heart rate, you'll feel it. Your heart struggles to pump out enough oxygen-rich blood to the rest of your body. The decreased amount of oxygen in your body can lead to a buildup of lactic acid. Side effects of elevated lactic acid levels include muscle soreness, loss of strength and limited range of motion. Exercising above 85 percent of your maximum heart rate is not recommended, according to the Cleveland Clinic. You do not get any additional physiological benefits by working out at this level and it can pose a danger to your cardiovascular and orthopedic health. Stop exercising if you experience any pain, shortness of breath, dizziness or difficulty breathing. According to Dr. Michael Lauer, the director of clinical research in cardiology at the Cleveland Clinic Foundation, the maximum heart rate does not indicate the level of cardiac health. Instead, cardiac health should be figured by how quickly your heart rate falls after you stop exercising. Studies done by Dr. Laurer indicated that those whose heart rate fell 13 beats or more within a minute after vigorous exercise had a decreased chance of dying in the next six years than those whose heart rate fell 12 beats or less. During a workout, aim to be in your target heart rate zone with moderate-intensity exercise for 30 to 60 minutes, five days a week, to build aerobic fitness. Moderate-intensity workouts include exercises such as walking, roller skating and water aerobics. You can achieve similar results with 20 to 60 minutes of vigorous-intensity exercise, three days per week. Carefully monitor your heart rate during more intense exercises such as running, mountain climbing or cycling at more than 10 mph. You run the risk of coming close to your maximum heart rate during vigorous-intensity exercises if not carefully monitored.